April 22nd is Earth day, a day to be reminded of the importance of keeping our earth clean, minimizing waste and preserving our delicate ecosystem. Recycling plays a big part and as consumers and manufacturers, we each have a role to play. Recycling can also be a great way to save money or make some extra cash. 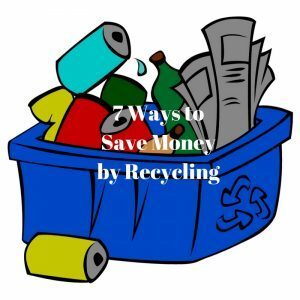 In this post I will discuss 7 ways to recycle and make/save some money in the process. Moving can be a big ordeal, especially if you include the added costs that come with it. A good way to reduce the cost of moving is to find ways to get moving boxes for free. Ask your employer if they can save the larges boxes they receive from shipments and collect them until you have enough for moving. If you ask well in advance you may collect all the boxes you need to move. If you do not have this option you can always ask friends to see if they can get boxes from their employers on your behalf. Retail stores are another good place to get free boxes. Many retail stores receive their shipments early in the morning so this is the best time to ask for empty boxes from their shipments. Buying shipping or moving boxes from U-Haul or Staples can cost you between $2.00- $2.50 per box. If you multiple that by the number of boxes it takes to move an entire apartment or house, the numbers can add up. Considering most people simply dispose of the boxes once used, this is a great incentive to save money. An added bonus would be to take the used boxes when finished to a local recycling depot so they do not end up in the landfill. 2. Ever since I was a university student I have had a printer at home to save money on the printing costs that the school charges. To save on the cost of paper I would reuse my printed paper the following semester for rough work, brainstorming ideas and even printing new course material. Even though I am no longer a student I still use this approach. I have a box in the office room where I keep all of my scrap paper. When I need to print something or brain storm ideas, I use these papers to write out my thoughts. 500 sheets of printing paper can cost $5 to $8 or a box of printing papers can cost $20 to $40 depending on the retailer and quality of paper. By reusing printed paper whenever possible, I almost double the length of time between new printing paper purchases, saving money and the environment. 3. Ink cartridges are made up of plastic and other petroleum based products which take many years to decompose. Many environmentalists believe that only 20%-40% of ink cartridges are recycled, the rest end up in land fills. Fortunately, a lot retail stores and organizations are providing an incentive for people to recycle their ink cartridges by offering store credit for empty ink cartridges. Office Max will add reward points to your Max Perk account for returning qualifying cartridges. Staples also has an ink cartridge recycling program where you can earn $2.00 in recycling reward points for every ink cartridge you recycle. These savings can be used to reduce the cost of your next ink cartridge purchase. 4. Bottle depots across the United States offer refunds for returned empty bottles and containers. Although the refund amount may vary based on which state you live in and the composition of the item, amounts ranges between $0.05 to $0.20 an item. 5. 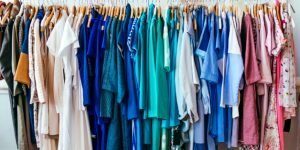 If you have some clothes that you no longer wear, and want to make some money for them, retail stores like H&M will pay for your old clothing. H&M will give customers a $5 voucher towards the purchase of new clothes at their stores. This voucher can be used on your next purchase of $25 or more. With the recycled clothes H&M makes new clothing which they sell. Their recycled clothing’s are marked ‘H&M conscious’ and are usually located in a designated section in their stores. 6. A lot of scrap metal that we may consider junk may be worth some money at a scrap metal shop. Depending on the weight and the composition of the metal, you can get a bit of money by recycling your scrap metal. 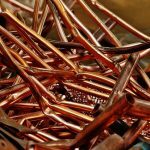 Scrap Monster has a helpful guide on what recycled metals are worth and how much you can expect to get for them by weight. 7. If you enjoy gardening, then making your own compost is a great way to save money. Compost adds nutrients to the soil, making plants healthier and improves the quality of fruits, vegetable and flowers. It also provides protection against the elements. Although commercial fertilizers provide these benefits, natural compost has the benefit of being environmentally friendly. Examples of compostable items include: fruits & vegetable, garden clippings, crushed egg shells, wood chips, pine needles and much more. Backyardboss has a complete list of items that can be composted and the nutrients they provide the soil. Natural compost saves money by providing an alternative or reducing the need for commercial fertilizer. Almost 30% of garbage waste can be composted, making this a great option to save money and keep our environment clean.